There has been such an awesome response from everyone to my Saint Prickolaus and Stanley the Cactus Snowman patterns and I had so much fun making them that I just had to make it a trio. Since Saint Prickolaus and Stanley were taller cacti, I decided I wanted to go with something a little smaller. Randy the Reindeer Cactus was the natural addition to the trio and I’m so excited to share him with you. 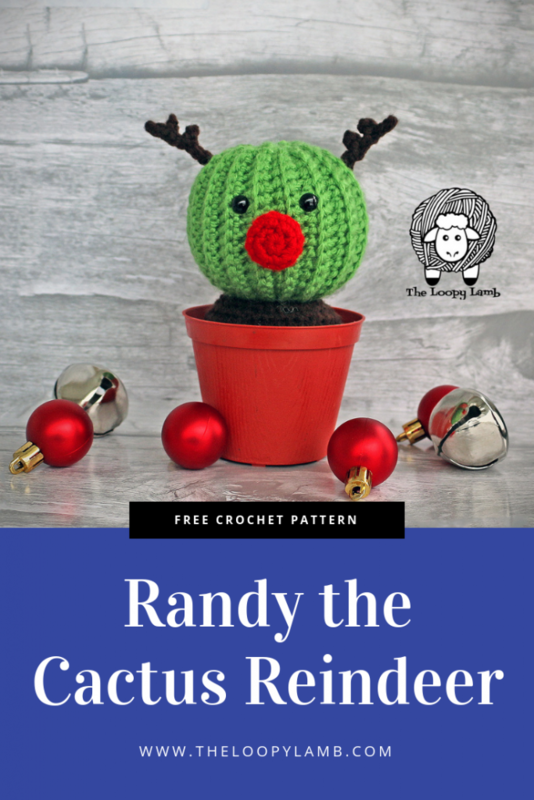 Randy is made of a single small barrel cactus, a red nose and some antlers. 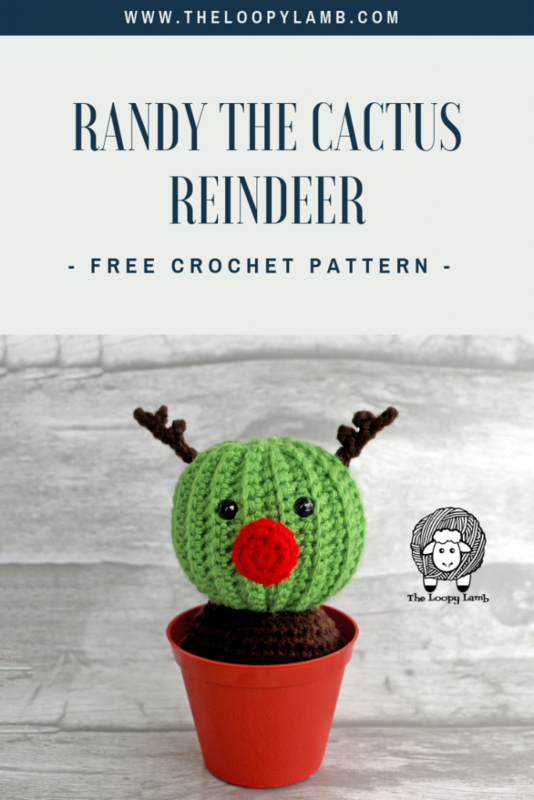 You could make yourself a whole team of adorable cactus reindeer if you made one with a red nose and another 8 without the nose. How adorable would that be?! 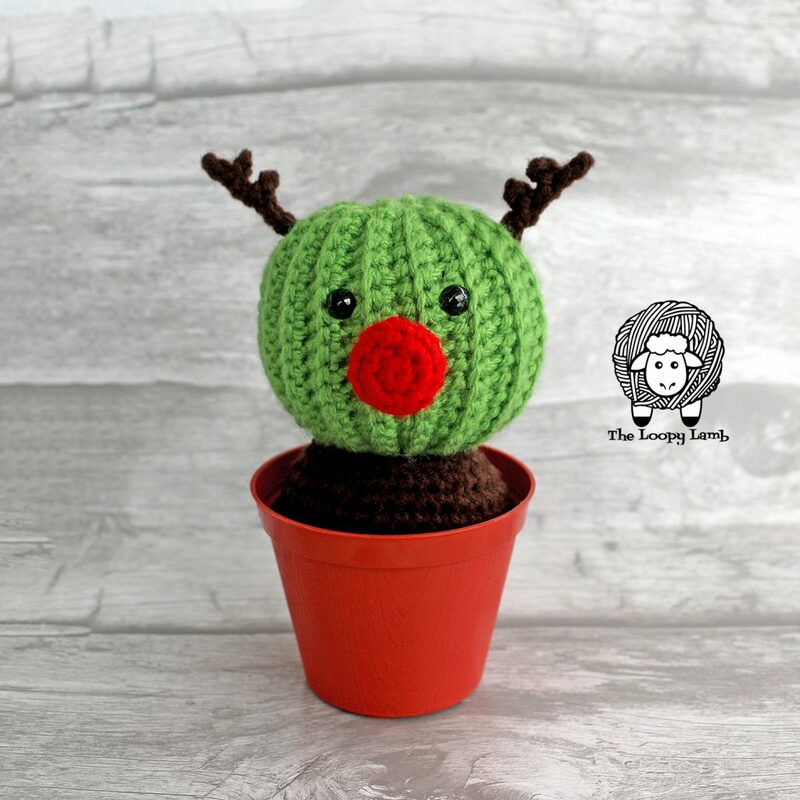 I’ve had the idea of making the cactus reindeer team for a while and wasn’t sure if I wanted to add soil to the cactus pattern or not but decided to add it at the last moment so if you’re interested in making only one cactus and putting it in a pot, you’ll have the soil instructions in the pattern. When I first started out making and sharing my own crochet patterns, I really loved making crochet cacti. I started making crochet cactus characters with names and their own little personalities. Some people told me that I had an “oddly specific hobby” and that my designs were a little weird. I could’ve have let that deter me and stopped making my little cactus designs but no way! I embrace my weird and I love it. Weird or not, you can’t argue with Randy’s cuteness. So even though Randy isn’t your typical holiday decor, that’s what makes him special. Enjoy your cactus reindeer and don’t forget to tag me in your posts or use #theloopylamb so I can see your makes. 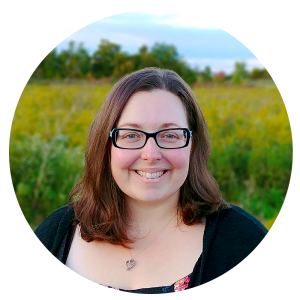 Stay tuned for another free crochet pattern next week! Worsted Weight Yarn in Green, Brown and Red. I’m using Bernat Premium in Spring Green, Red and Loops and Threads in Chocolate Brown. FO leaving a long tail and sew onto the right side of the head. FO leaving a long tail and sew onto the left side of the head. FO and leave a long tail to sew on to the head.